In the early 1950s Maserati had achieved racing success and international visibility, thanks to cars such as the A6GCM; its 2-litre, twin cam inline-six engine had already been enlarged to three litre capacity on the Maserati 300S. Chief engineer Giulio Alfieri felt the next step was to design an all-new 3.5-litre engine; the resulting long-stroke six, designed foremost for endurance racing on the Maserati 350S, was ready in 1955. In the meantime Maserati's first forays into the grand tourer market, the 1947 A6 1500, 1951 A6G 2000 and 1954 A6G/54, had proven that the business was feasible; but the A6 road cars were still built in just a dozen examples a year—hardly series production. A different approach was needed to build fully accomplished grand tourers. The main development efforts that led to the 3500 GT were carried out in 1956–57, despite the frantic activity required by Maserati's participation in the Formula 1 world championship. Alfieri modified the 350S's engine to suit a touring car, e.g. by switching to a wet sump oil system and changing the engine accessories. He also made several business trips to the United Kingdom in order to contact components suppliers. None were found in Italy, as Italian taxation system and the industry structure forced manufacturers to design every part in-house; a daunting task for small companies like Maserati. Thus the 3500 GT alongside Italian Weber carburettors and Marelli ignition, used many British-made components such as a Salisbury rear axle, Girling brakes and Alford & Alder suspension parts. Next came the bodywork. According to Carrozzeria Touring's Carlo Felice Bianchi Anderloni it was Commendatore Franco Cornacchia, a prominent Ferrari dealer, that put in contact Maserati owner Omar Orsi with the Milanese Carrozzeria. The first 3500 GT Touring prototype had a 2+2 body, with superleggera construction and was white in colour; it was nicknamed Dama Bianca (White Lady). Two 3500 GT prototypes were shown at the March 1957 Salon International de l'Auto in Geneva. Both had a 2,600 mm (102.4 in) wheelbase and aluminium bodywork; they were Touring's Dama Bianca, and another one by Carrozzeria Allemano. Touring's proposal was chosen for series production; few changes were made to it, chiefly a more imposing grille. ^ AISA (2000), p. 1. ^ a b c d AISA (2000), p. 2. ^ a b AISA (2000), p. 8. ^ a b "Maserati 3500 GT Touring". Maserati official site - About us: Heritage. Retrieved 6 February 2015. ^ AISA (2000), p. 5. ^ Giovannini, Giovanni (14 March 1960). "Le auto italiane al centro dell'attenzione nel Salone di Ginevra". La Stampa (in Italian). p. 5. Retrieved 10 February 2015. ^ "Maserati 3500 GT Convertibile". Maserati official site - About us: Heritage. Retrieved 6 February 2015. ^ Bernabò, Ferruccio (10 March 1960). "Il Salone di Ginevra quest'anno batte per ampiezza tutti i primati". Stampa Sera (in Italian). p.��9. Retrieved 10 February 2015. ^ Tabucchi, Maurizio (2003). Maserati: The Grand Prix, Sports and GT cars model by model, 1926-2003. Milano: Giorgio Nada Editore s.r.l. p. 215. ISBN 8879112600. ^ Bernabò, Ferruccio (5 November 1959). "Linee e soluzioni nuove sulle fuoriserie del Salone". La Stampa (in Italian). p. 7. Retrieved 10 February 2015. ^ Uso e manutenzione vettura 3200 G.T. [Maserati 3500 G.T. car, owner's manual]. Officine Alfieri Maserati S.p.A.
Alfieri, Giulio; Bianchi Anderloni, Carlo Felice; Orsi, Adolfo; Colombo, Alessandro. The Maserati 3500 GT (PDF). The Maserati 3500 GT, by its designer, Giulio Alfieri; Museo della Scienza e della Tecnologia, Milan, 12 April 2000. Associazione Italiana per la storia dell'automobile, conference. 46. Translator: Christopher Gawne. AISA. 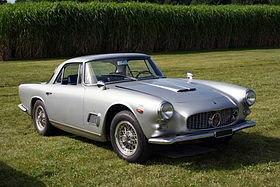 Wikimedia Commons has media related to Maserati 3500 GT.